Dear Mr Abdul Jalil: Ever since this morning, I am feeling very sick to my stomach. I feel like vomiting all day. It is not because of something I ate but it is because something you did, which is proving very hard to digest. You left us, who fought for some ideals, cheated. You betrayed the policy that you championed the last 5 years just for some petty short-term interest of getting to power. Today, we watched with disbelief and horror your 5-point agreement with a little known party Khelafat-e-Majlish. You termed it as a “tactical electoral ploy.” My utter disbelief turned into shame when I turned on ATN Bangla to find you defending the “good fatwas” against the bad ones. When pressed on by the journalists, you say with total nonchalance: “I know what I signed” without providing any explanation why you did it. You couldn’t even defend the stand that you took and lied on camera that didn’t sign anything regarding the Ahmadiyas. Excuse me, Mr General Secretary! Have you got no shame? Have you ever thought there are actually people who follow politics because they support a principal? Before throwing this slap at these people who has been supporting AL for a return to non-religious politics, did you even care to think about them? Or Mr GS, sitting in that well-cushioned office for the president of Mercantile Bank, have you become so tone-deaf that you can’t hear the pulse on the street? Just when we have to digest your open embrace with Ershad, you decide to slap us again with this new deal? Mr GS, do you know that there was once a time you had a party, which actually stood for something? In 1971, it brought upon secularism and social justice in the Constitution? As much as it is hard for you to believe, there is a sizable population in Bangladesh who still believe in these ideals and there are people who believe in religious identity and our Bangladeshi Muslim identity. You are making a huge mistake by taking them for a ride. Dear Mr Jalil, you think the people who support secular politics and who are scared of by the politics of BNP-Jamat have no choice but to vote for you? Think again. If there is so little difference between BNP-Jamat and Awami League, then they will just stay home on election day. If this deal is not cancelled, we will know that you care very little about the support for progressive force and are not afraid to plank down years of earned credibility and principles for the little gain, if any, you will make with the Moulana votes. Dear Mr. Jalil, it is by no accident that Awami League has been in power only for 5 years in the last 30 years. It is years of political ineptitude, inconsistencies and perception of opportunism by its leaders, which caused this. More importantly, it is because of monumentally fatal decisions like these in the past 20 years, which sealed its fate. But still we were willing to give you guys a second chance this time around seeing the long-term danger of Jamat in politics. We chose to ignore years of Awami hypocrisy and inconsistencies. You went in election in1986, 24 hours after declaring the participants of election under martial law will be known as national traitor. You brought Jamaat in the same table with you and gave them the first legitimacy. You first resuscitated Ershad in national politics to get into national alliance. 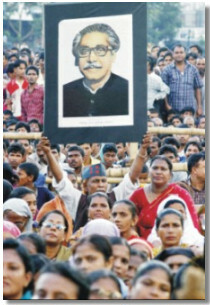 All the time, critics said that there was no difference between BNP-Jamaat and AL. Your supporters said there was a lot at stake in this election and we simply cannot afford another 5 years of accountability-less governance and religious infiltration in Bangladeshi politics of BNP. But your desperation to go to power at the cost any thing makes our head to bow down in collective shame. Mr GS, how dare you ridicule and make light of our support for the ideals to which this country was founded? Mr GS, you may think that this is election time and every thing you do is justified under the name of “tactical ploy.” Well, I have some news for you. In this election, if AL wins, it will be not because of they are a better party than BNP. It will be because people are so turned off by BNP, they like to vote for anyone but BNP. It is our misfortune that the ideals that we cherish are hijacked by people like you in Bangladeshi politics, who has no sincerity for ideals or principle. To you, principles can change with every news cycle as long as you can provide your own self-made rationalization for your stand and say that the people are with you. But do know that winter does not go away after one December. Next time, you need friends in the progressive circle; please do know that will not forget this backstabbing. If they stay passive and do not treat you any differently than BNP-Jamaat, please don’t be surprised. Because, after all, parties are judged by their actions and your actions, dear sir, are not much different from those of BNP-Jamaat. We will rather wait for the party that truly believes these progressive ideals rather than support a morally bankrupt party such as yours, who just uses these as lip service when it suits them and dumps them before election when they think it’s a liability. Mr GS, please don’t underestimate the hurt and anguish that has been caused by your action. If you don’t cancel this deal, you will be repaid for your betrayal for a long time to come. Dear Mr Jalil, you have very little credibility after your April 30 deadline in 2004. In any other country, you would have been thrown into the political dustbin after that monumental political failure. Still it’s a miracle that you lived through that to cause another similar proportion catastrophic failure yesterday by signing this 5 point agreement with a little known fundamentalist Islamist party and effectively stabbed in the back of your party workers and supporters. You owe them an explanation. For a party that regularly tries to milk the liberation war for its own advantage and for a party that got a lot of mileage from the 2001 Hindu oppression and 2005 Ahmadiya discrimination, you owe them an explanation for signing a deal that goes completely against your previous political stands. You still have a chance to control the damage by scrapping this deal. If you want to have any shred of political credibility for the future, you will want to scrap this deal. Otherwise, you will not find the friends with you when you need them, and believe me, you will need friends a lot sooner than you think. Scrap or no scrap, do know this, that from now on we will make it very, very expensive for you to take our support for granted. The author is the founder of Drishtipat.